The only thing I see that is distinctly different about me is I’m not afraid to die on a treadmill. I will not be out-worked, period. You might have more talent than me. You might be smarter than me. You might be sexier than me. You might be all of those things. But if we get on the treadmill together, one of two things will happen: either you’re getting off first, or I’m going to die. It’s really that simple. I couldn’t agree more with the Fresh Prince. Nobody ever got anywhere without a little stoney-nosed perseverance. Whether it’s voice recognition helplines, triple clasp bra straps or novels over 300 pages. Endeavour is why we grit our teeth and plough on in the face of all manner of adversity. Endeavour is why Jamie Milner plays for the Premier League champions. Often ahead of Jesus Navas – a World Cup and European Championship winner, no less. Most paths to the top are muddled and obscure, with various developmental leaps and the odd fortunate break paving the way. Jamie’s story is a much simpler one. He is where he is because he’s the poster boy for giving 210%. A Boy Scout marathon runner. In a league full of incredibly fit athletes, Milner is the patron saint of the extra mile. Milner’s career resembles the weak batch of industrial glue that went on to become the Post-it Note. Every passage of play evolves into an inadvertent success. That heavy first touch turns into a possession-winning tackle. Chasing down his own over-hit pass becomes a makeshift through ball. You might have more talent than Jamie. You might be smarter than Jamie. Hell, you might even be sexier than him. But when you’re both going after a loose ball near the corner flag, one of two things will happen: either you don’t come away with the ball, or Jamie dies. It’s really that simple. It’s a wonderful attitude to have. Give me the hungry man, keen to prove his muster, any day of the week. Life isn’t an ice cream; if you accidentally lick the top off and it falls on the floor, you can’t simply ask for another one. You just have to get down on all fours and battle the neighbour’s dog for the best bits of what’s salvageable. I really feel this is a lesson Jesus Navas has yet to learn. Milner wouldn’t even need asking. He’d be straight down there on his knees, hunting down the scraps – just like he does on the field of play. There are 99 reasons why Navas should be a better footballer than Jamie Milner, and there’s only one why he isn’t. That treadmill. Milner might look more Neanderthal than right-sided midfielder, with those impossibly widthy forearms and jawbone three sizes up from his skull. But there’s more to the Humbersider than being a perennial contender for “Footballer who looks most like he wipes his arse with moss”. He has a heart that’s also three sizes up from the rest of him, and a desire that can only be measured using interplanetary equipment. When Manchester City ran out of anything resembling a striker in early November, they held trials to see who could play up top. Despite being one of City’s least skilful outfield players, there was only one winner. Pellegrini turned Milner into his big number nine and City promptly embarked on a 14-game unbeaten run. Football the Milner Way isn’t without its own unique pressures. The only direction can be down for the man banging on the glass ceiling of talent with both fists. A ceiling that’s never going to be breached unless and until Milner significantly reduces the number of times he dribbles directly out of play. What must this do to a chap’s psyche? All that’s left is nervous contemplation of those more talented further down the order. Fretful glances at the Abdel Taraabts of this world, operating at 60% of their potential, who could shoot past Jamie at any moment. There are, after all, inherent limitations to Milner’s game. For instance, it is impossible to tell which team has the ball when Milner goes on a run. Milner in possession is football’s dark matter. We’re fairly confident it exists, but even the cleverest minds can’t definitively prove it. It must be hell for those totting up possession statistics. They presumably just split the difference as a succession of heavy touch – tackle – heavy touch – tackle sees Milner propel the ball in gauntlet-like fashion towards the opponent’s byline. Never in control, never out of control, Milner doesn’t so much beat a man as he does engage him in a series of hostile encounters. Meeker footballers are also available. But it’s this desire, coupled with lungs the size of hot water bottles, that gives Jamie his fighting chance; his toe-hold at the top table. Each week Milner solves the footballing riddle with the blunt tenacity of an angry man trying to kick down a small tree. It can never be a beautiful process. But it is a process. One that put Bayern Munich to the sword in their own back yard in 2013. This season Milner has raged against his own mediocrity. In a team full of polished diamonds, it is Milner who has carried the fight. With the forward line arranged head-to-metatarsal on the physio table, and Yaya brooding over half-forgotten grievances, Milner has stood up and been counted. In a side better known for its balletic dismantling of opponents, Milner has thrashed, cajoled and bullied teams into submission. There’s something noble in Milner’s toil. Almost knowingly sacrificial. His very luminescence in a team of superstars will undoubtedly lead to the conclusion that reinforcements are necessary. Duly leaving him with more competition than ever before. The reality is that Milner shouldn’t be good enough for a starting place in the Manchester City Project. And yet, somehow, he is. By definition, Milner is the last man on the team-sheet. Never a solution in himself, simply a question put to others. He’s the Gaffer’s Gambit in five or six different positions; Option B in a probing managerial game of “Would You Rather?”. In a very real sense, he is every footballer’s acid test. Because, if all else fails, Milner will do a job. If needs be, he’ll do it in your position. Such wedded commitment to scorching every blade of grass is admirable. What worries me is whether it has become a handicap to Milner’s creative development. Whether skill and guile have become bartered properties in return for an unnerving omnipresence on the heat map. In a game invariably won and lost through the brilliance of thought, fans go home happy because Milner gives them 110% of his legs and lungs. If he would give them perhaps just 80%, we might find we have the English Iniesta on our hands. As it is, we’ve got the Rino Gattuso of wide midfield, block-tackling his way into dangerous areas. He just keeps on rushing around. Either, like Bruce Forsyth’s career, he point blank refuses to slow down. Or, like the bus in Speed, he simply can’t. This ethos has consciously moulded the Milner we see before us. There are known knowns with Milner, nothing else. Never departing from the playbook, Milner sings from the script of pre-remembered drills from Thursday’s training. His career a dogged perfection of all that can be seen, without ever paying regard to the outer reaches of what ability he might actually possess. The obvious comparison is Dimitar Berbatov. It’s tempting to look at how hard Berbatov works, versus how hard Milner works, and draw conclusions that don’t flatter the Bulgarian. However, contrast that with how hard Berbatov’s brain must be working, against how hard Milner’s brain is working, and you have a different story. Milner’s dedication to the visible is commendable, but it is Berbatov who is training himself to see beyond the horizon. So who’s really working the hardest? Whether Milner can change – whether he should change – perhaps misses the point. There’s an even bigger battle at stake. Absent the short-term rehypothecation of Frank Lampard, Milner is the only English outfield player that gets a game for the reigning Premier League champions. Barry’s gone, Lescott’s gone, Micah Richards is in Florence and Scott Sinclair may or may not exist. Milner’s in bat for l’Angleterre. The last man standing for the Grand Old Party of world football. Every time he’s tossed a substitute’s bib, a little more of the empire dies. After Jamie, only Joe Hart remains. And I’m deeply uncomfortable with the idea that the only Englishman who plays for the champs is the one that’s allowed to use his hands. It’s demeaning. 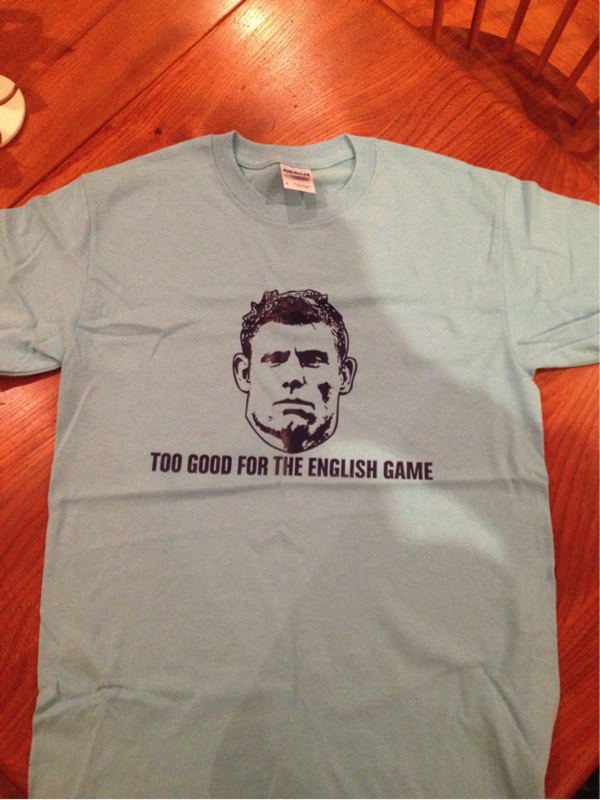 So I urge you all to get behind Milner. Savour every ricochet and cheer the moments when he keeps the ball in play. In short, hold fast that which is (quite) good. Because Milner represents the book-end of a crumbling dynasty. He’s the flickering embers of the dying superpower that invented and codified the game. And while you might think saving English football is something of a lost cause, fear not, Jamie’s well-versed in chasing after them. Available in all good clothes stores. Interesting tack of commenting “anonymously” and then referring to your paternal influence. I’ll hand it to you. You saw Milner’s virtues (such as they are) long before I did. Didn’t call him boring though, did I?